So many friends have expressed interest in what shopping is like in Germany. I’m asked if anything is similar to what we have in the USA. Clothes shopping? Food shopping? What is it truly like living and shopping in Germany? Well, let me tell you. There are a lot more similarities in shopping than I could ever have imagined! Take the Hagebau, for instance. 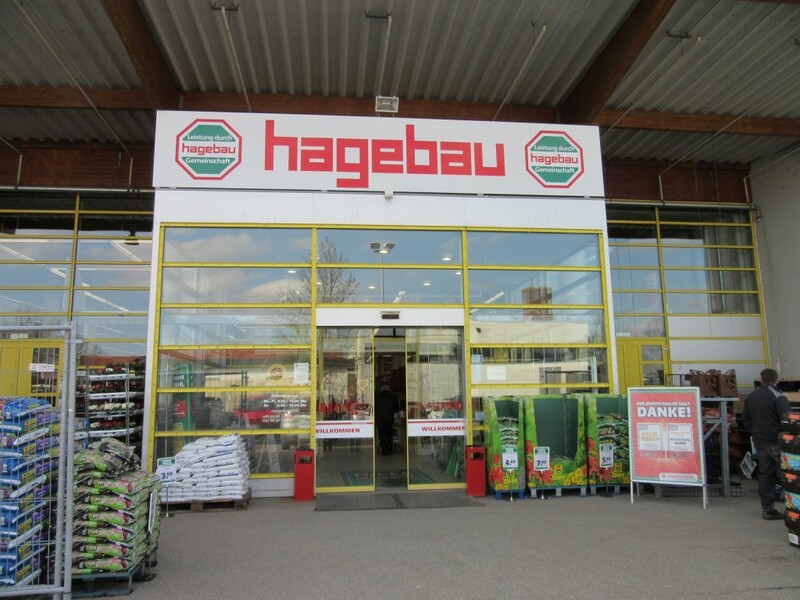 The Hagebau are a chain store here in Germany, quite like our Home Depot or Lowes, but a little on the smaller size. And they are everywhere! Any decent sized town has its own Hagebau, but not all Hagebau’s are created equal. Dan and I have shopped at many of these stores and their content will vary from store to store. And the size of each store also varies. The Hagebau in Miesbach has a huge elaborate Christmas center. 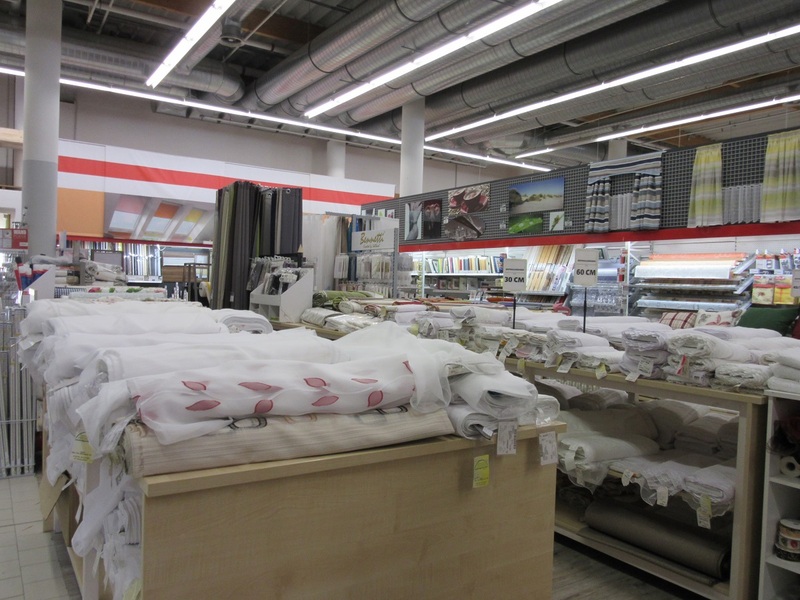 The really big Hagebau in Ottobrun has tons of household goods, pet supplies and hobby fish tanks. Our Hagebau down in Brückmuhl, features a sewing center with bolts of sheer and lace curtain materials and material for tablecloths. They employ a seamstress full time to run that department but when not selling yard goods, she is at her professional sewing machine making tablecloths, pillow covers, pot holders and even lampshades! 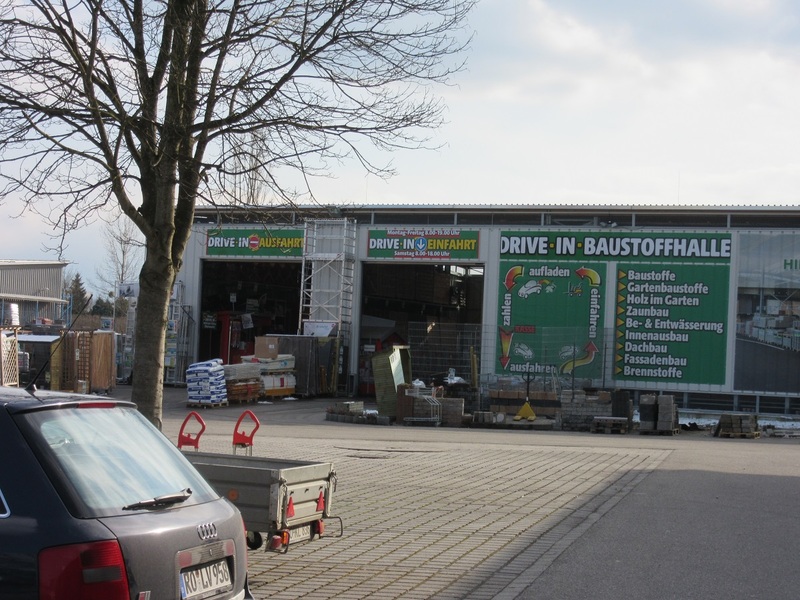 Hardware, Garden Center, Tools, Wood, Craft supplies and more, let’s visit the Hagebau! 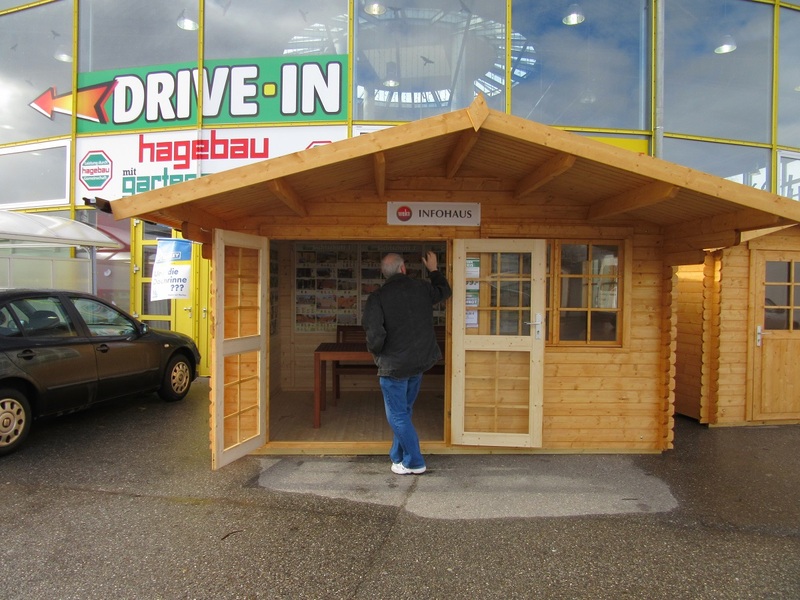 Our local Hagebau has displays of these beautiful garden sheds/ cabins/ play houses. Dan so badly wants to bring one home with us. The craftmanship is fantastic. Everything is dovetailed and fits perfectly. Plus, they are a great value. Even the windows are handmade! Outside are your typical garden plants, flowers and veggies. 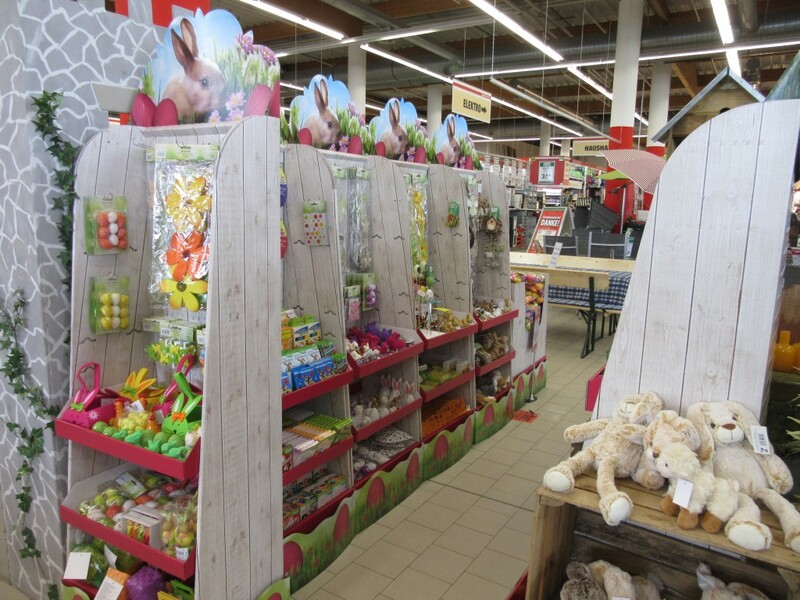 In Bavaria, the outdoor display is 10 months of the year. Walking through the automatic sliding doors you’ll notice the store is laid out just the same as any USA home improvement store. Brightly lit. Departments are clearly labeled, how be it, in Deutsche! Pretty good sized! 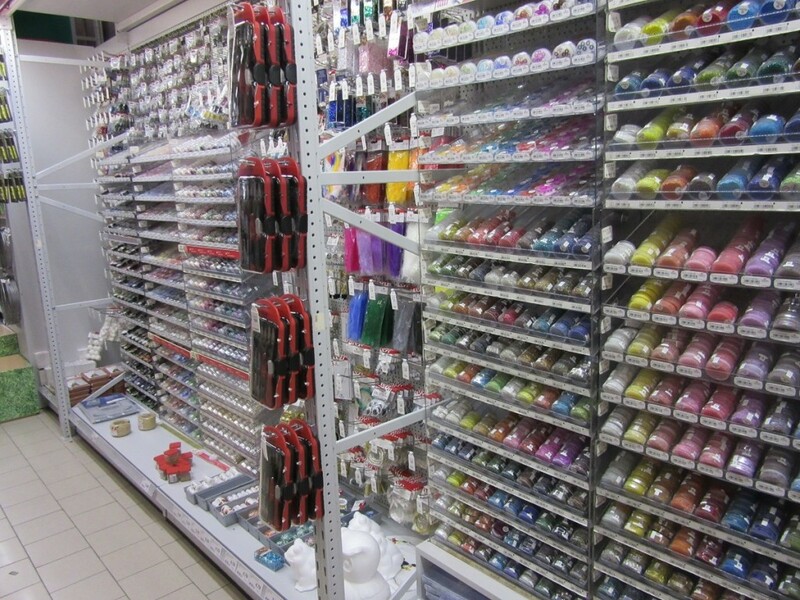 Paint department. Work clothes and steel toed boots. Plumbing and bathroom remodel. It’s all here! 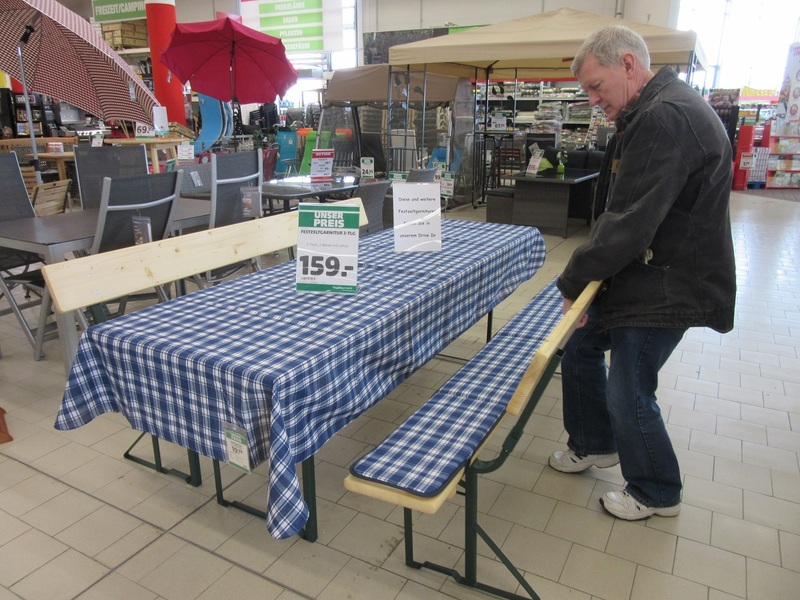 These tables with detached benches like they have in the Biergartens are another item we’d like to bring back with us. Quality craftsmanship and sturdily built. Bolt after bolt of lace curtain material which is what every single Bavarian house has as window treatment! Nope, no calico here. No flannel or wool or corduroy either. There is one small aisle at this store with modest amounts of craft supplies. Mostly beads and jewelry making supplies. Crafting is not huge where we live. Easter, on the other hand is wildly popular. Eggs of all shapes and colors along with ceramic bunnies and Easter egg dying supplies. It’s traditional here to hang colored eggs outside on the branches of small trees. 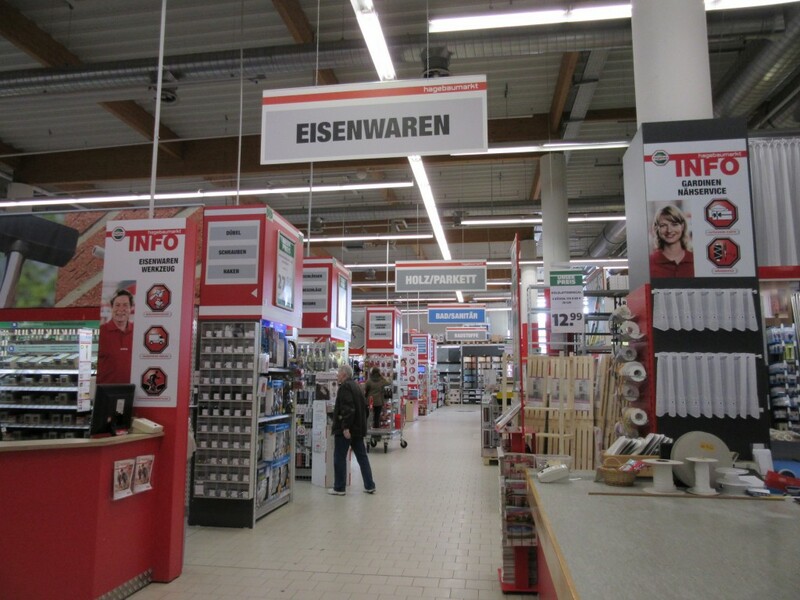 The quality of German tools has Dan wishing to buy out the store! 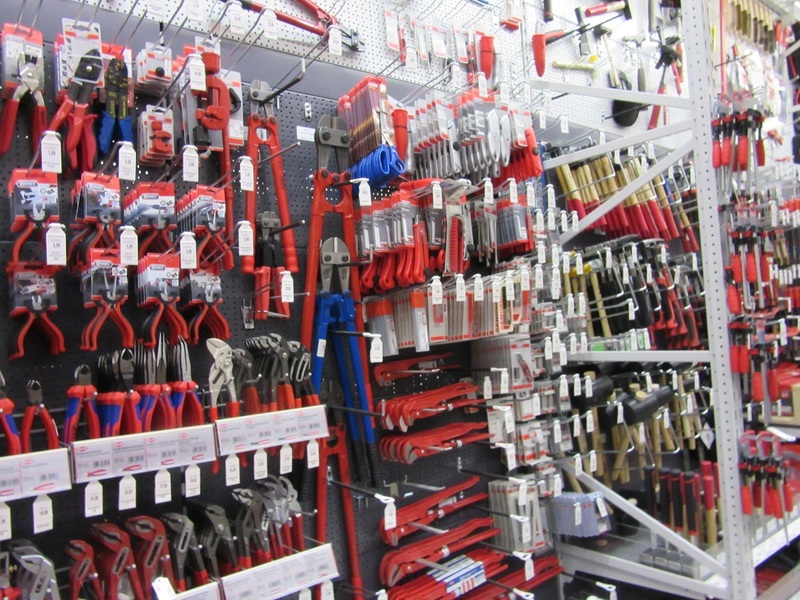 Germany is renown for tools of every kind. And, they are quite reasonable. Dan will be bring a few new wood working chisels home. 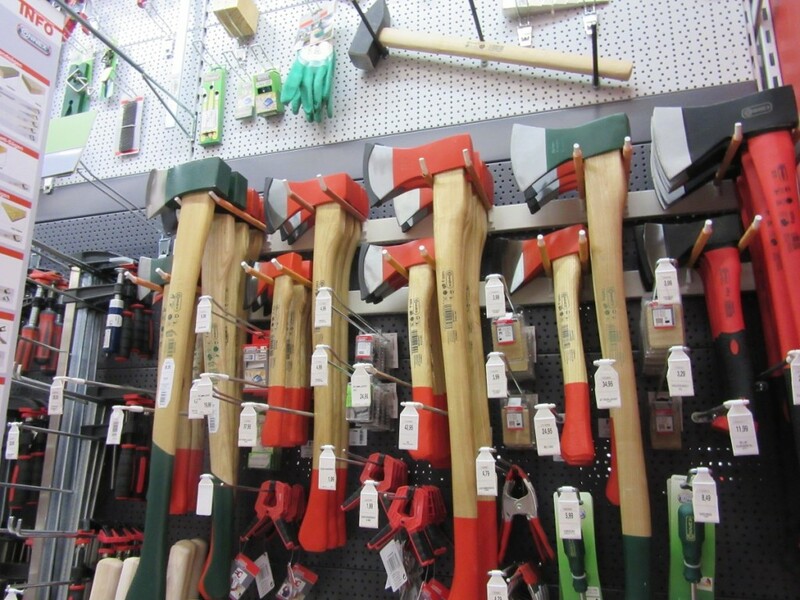 And one or two of these finely crafted axes and hatchets. He stops and admires them each time we visit the store. And then there is my favorite department. 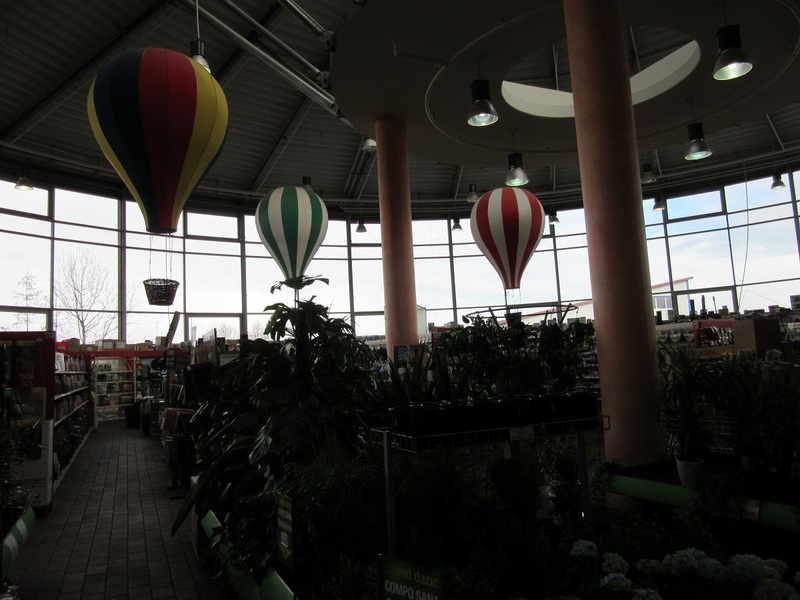 The Garden Center! The flowering plants and garden decor are just so much fun to look at and get decorating ideas. 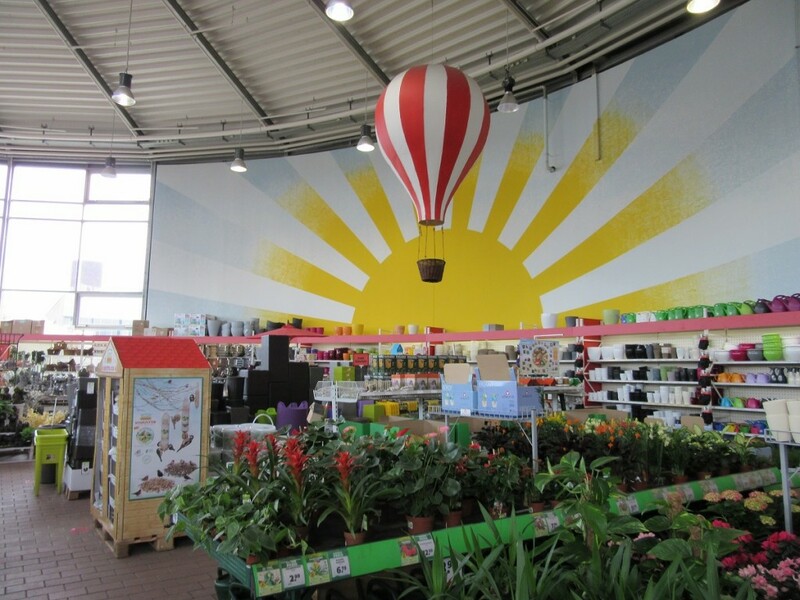 We see hot air balloons all the time in Bavaria so it’s not a surprise they were chosen to decorate the store. Vases, flower pots, garden tools, wind chimes share space along with the plants. The Builders Supply Department is in a separate building from the main store. And just like the USA, you drive in or Einfarht. The you drive out or Ausfarht! 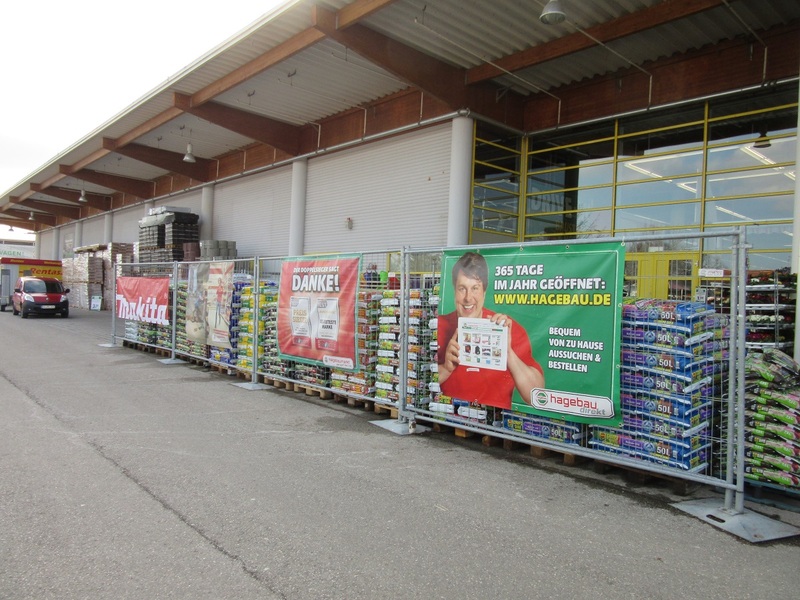 I hope you enjoyed out little German shopping trip to the Hagebau. So much is uniquely German and yet, so much is not unlike everyday life in the good ol’ US of A! Thanks for stopping by today. I hope your weekend is relaxing and pleasant even if it means several trips to your local Home Improvement store. I absolutely love the “ride alongs” with you! So much fun! Thank you Linda! I enjoy sharing my “rides” and truly wish all my friends were here with me! I would be spending a tone in the lace department. I love lace and honestly here in the states I haven’t seen a lot of lace. What a fabulous store. This is where I buy all my seasonal tableclothes. You just don’t see them anywhere else and I love them!